The time has come, that moment you’ve all been waiting for – the reveal of our spare room. *play the trumpets* How exciting, right? I thought this moment would never come as it’s taken so much longer than we thought! In fact in our spare room inspiration post back in September, we said we’d be sharing things in a week or so. Hm, so yeah fail on that! 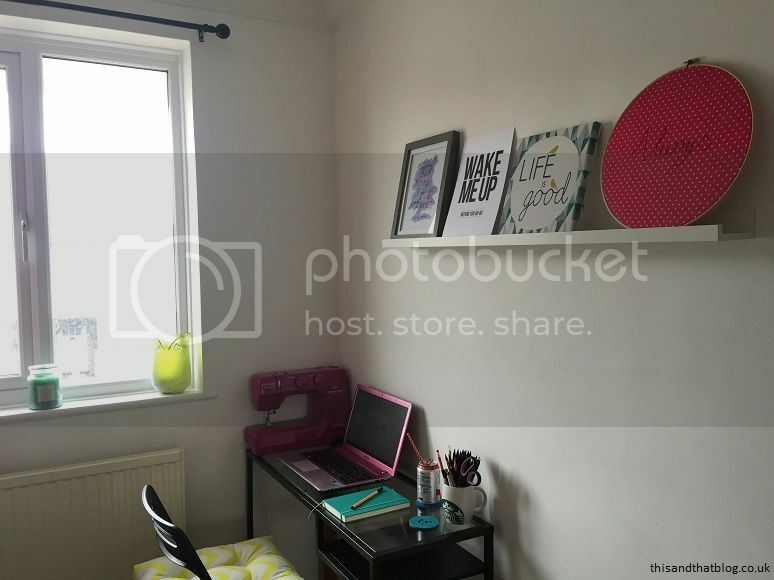 Anyway, after much deliberation and faffing and fails we’re ready to share that our spare bedroom/reading nook/sewing room/office room is good to go and we LOVE it! As you’ll see we stuck to our inspiration post in that it’s all white with pops of colour, a picture wall and lots of little fun bits and pieces. We’re trying not to add to much crap to it, that way it’ll stay useable and not become a dumping ground. Fingers crossed we can keep that going for a while as I fear that as soon as we start dumping things in there it’ll just get worse! There are still a few bits and pieces to do. For starters the curtain needs hemming(!) and I also want to add a wifi password picture and some of inspiring quotes and a blog post chart above the desk. But that’s it! So what are my favourite bits about the room or things in the room? The shelf stand was super cheap from TKMaxx but it’s got loads of character and is super useful for storing our stuff and other people’s things when they come to stay. All the cushions make for the most comfy of reading spots. The bed is multi-functional. It’s this bed from Ikea and not only does it pull out into a double bed and also has drawers underneath for all the bedding and towels. There’s no colour scheme as such. It’s all about white and bright colours, which means anything and everything works in there. 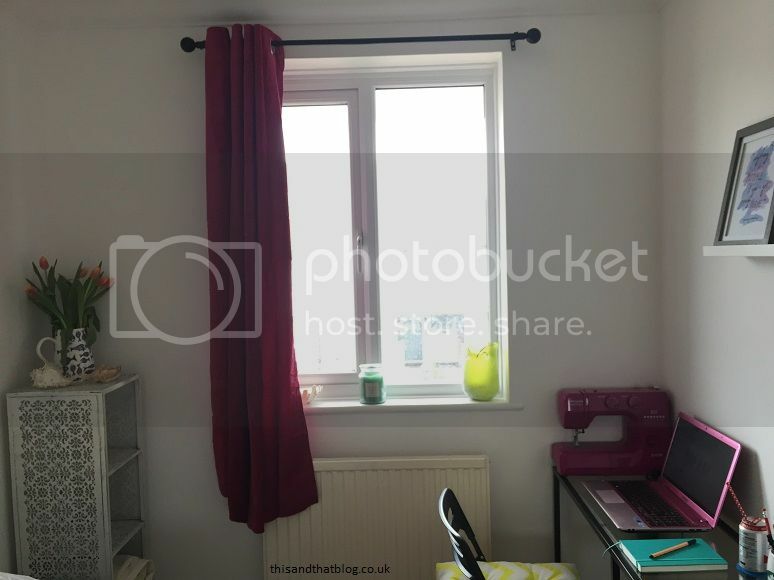 We were able to use a spare pink curtain rather than chucking it and both the glass green owl vase and the sea themed vase work perfectly in here. 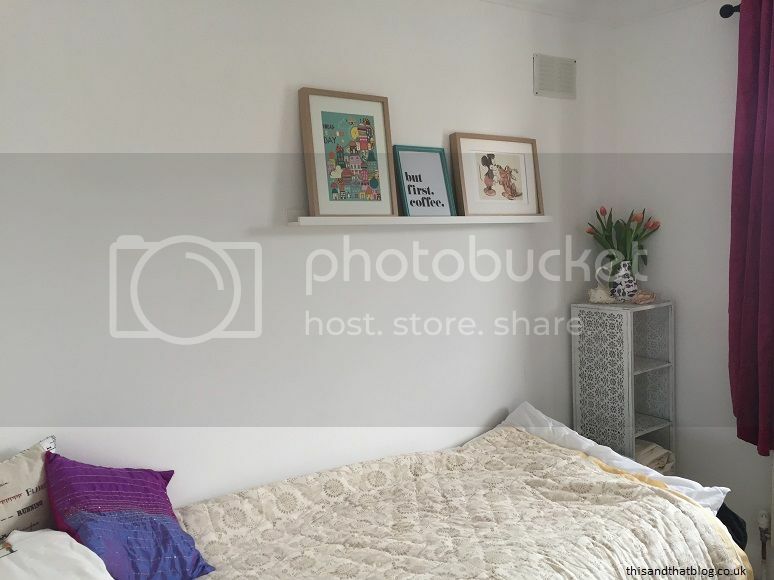 The picture shelves mean we can update the room as and when we want to. If we get bored of the pictures currently on show we can mix it up and rearrange it, perfect! The desk was once a side table from the hallway in our flat and it’s the perfect size for working at my laptop or sewing and we can keep both on their without any issues,. So there we go, our spare room/office/sewing area is almost there! About bloody time too!